Given the opportunity, my girlfriend would have had us upped and moved to Belbroughton some time ago. She yearns for a small cottage in this quaint village just far enough away from the city for me to not be able to invite a club full of people back to ours at 4am. She sells the dream with stories of being able to walk a dog down the hill to one its numerous pubs for a quiet pint and a game of darts. Utter rubbish. I am yet to meet a dog that could play me at darts. Don’t get me wrong, I like the village on the peripherals of the Clent Hills a lot, I just cant see me wanting to live there whilst my feet are slender enough to go dancing in a pair of tasselled loafers. But I also know I have very little choice. I am a man wanting a simple life with working eardrums and for this it will likely happen a lot sooner than I would like. I suggest we go for lunch to assess the quality of the food. The Bell is our destination. Its the gateway to Belbroughton from the less than picturesque A491. Its a big pub, looming from its perched hillside position. Inside it feels warm and vast, full of coves and twists and turns. I sit there and think how difficult it would be to wait tables here. Some nibbles arrive in the form of flavoured filo pastry. I ask the waitress what flavour they are; she tells me she doesn’t know, but that they are vegetable crisps. Its not the greatest start. 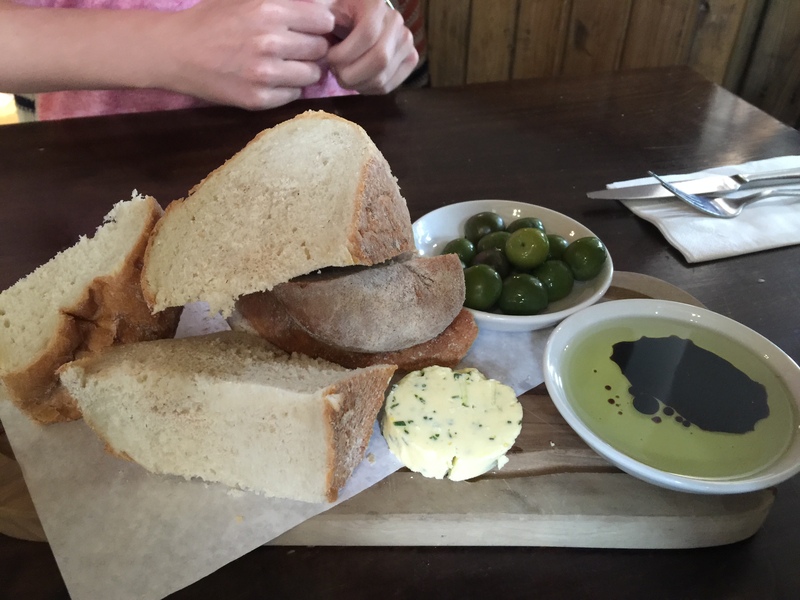 Bread arrives, a substantial portion for four quid, with olives, balsamic and olive oil, and a butter which tastes more unpleasant the more we have. I think its the astringent bitterness of raw garlic, though I don’t go back for seconds to confirm. My starter sounded much better on paper than it looked on the plate. A wedge of Brie, crumbed and coated, oozing on to a apricot chutney that was sweet and little else. It was a saccharine gloop, crying out for acidity and texture, not three sorry pieces of wilted rocket. 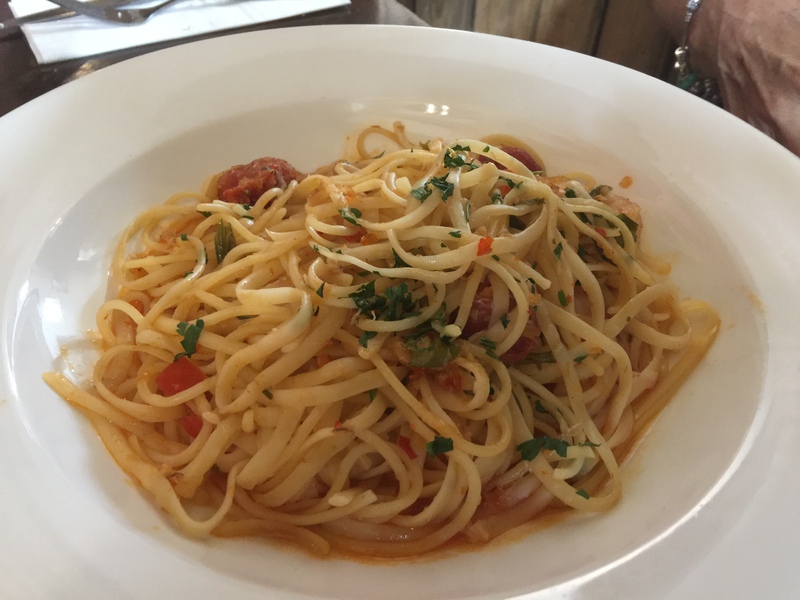 Far better was a hearty bowl of linguine, full of the advertised crab, prawn and chorizo, and fantastic value at £9. 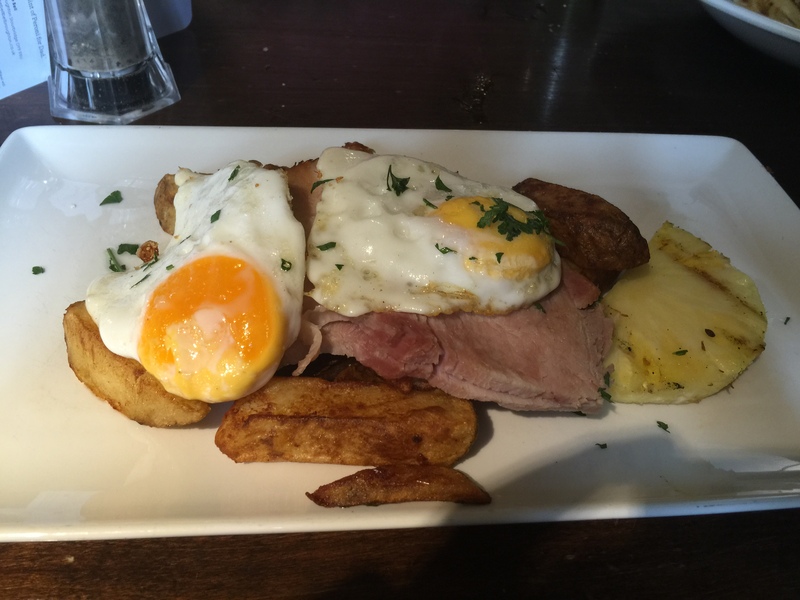 Ham and chips is a simple, but beautiful thing when done correctly. Here was two slices of good quality ham, let down by everything around it. Two eggs, cooked to a solid yolk that I could have played squash with – yes, they were changed when I mentioned it, but really, with no sauce it is obvious that the dish needed a runny yolk for moisture. Along side this was a wedge of raw pineapple which would repeat on me all day and skin-on chips, a fine concept had the spuds been washed correctly. 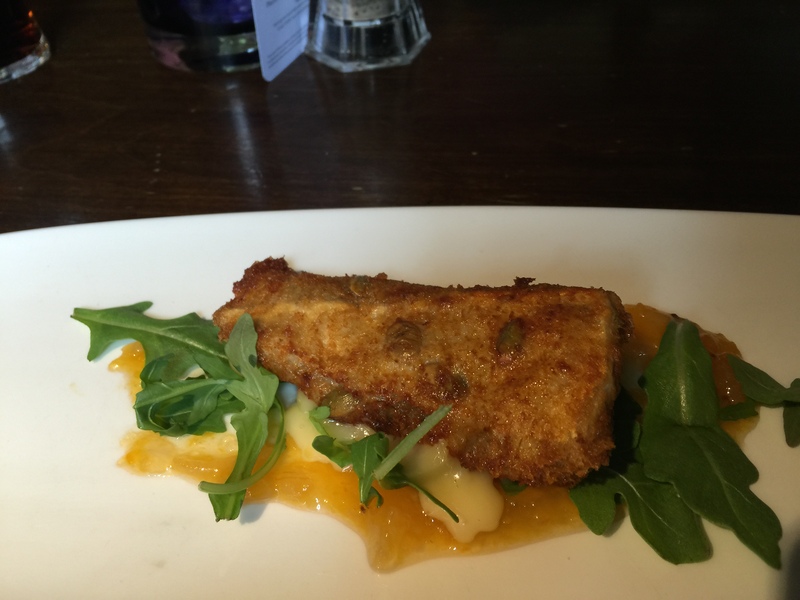 The gritty potatoes returned with battered halloumi; a dish slowly appearing on every gastropub menu. Here was a decent rendition, the bland cheese sitting nicely with good mushy peas and a tartar sauce in need of more poke. Service was slow, and that is me being kind, leaving no time for a dessert that I probably would not have had anyway. Even at early lunch the place was thriving, with more pouring in through the doors as we trudged disappointed back to the car. Maybe these people see something in The Bell that I missed. I wont be returning, not even when I give in and live within walking distance. The search for my future local continues. Unlike most of my culinary ramblings, the post that you are currently reading is not based on my first reaction. There is no need for me to type whimsy about the décor into the notes of my iPhone for later reference, nor did I need to study the menu on-line prior to eating. I knew exactly what I was getting before I sat down in the sparse landscape of bare concrete and metal that is Pure Bar and Kitchen, because I have been eating there well before this blog reared its ugly head. I should have wrote about its virtues long ago had I not been drawn into the blackboard listing endless beers time and time again. It’s the place I always start with the best intentions and leave disappointing myself. I go frequently because the food seldom disappoints. 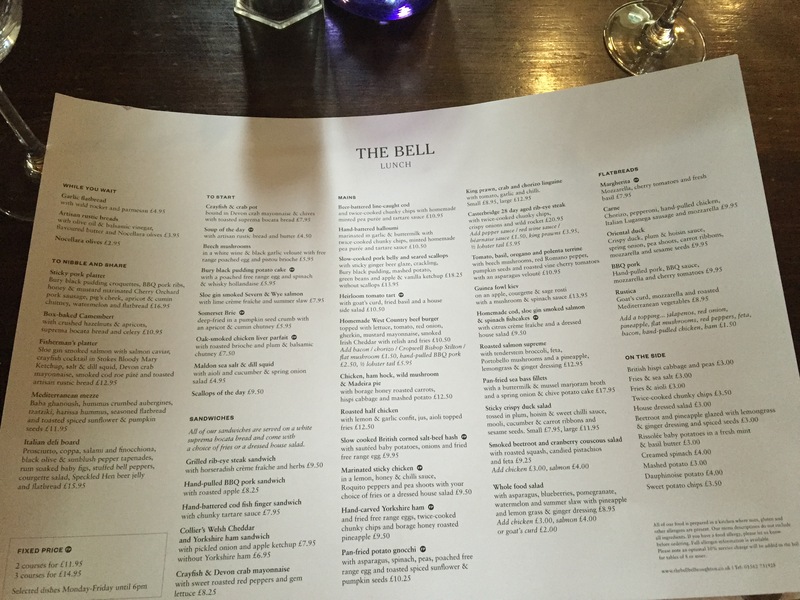 The menu has clarity, though it should having been designed by the man behind local Michelin triumphs Simpsons and The Cross. There are nods to ales on taps and suggestions for what beers to drink your food with that all tie in nicely with its links to Purity. 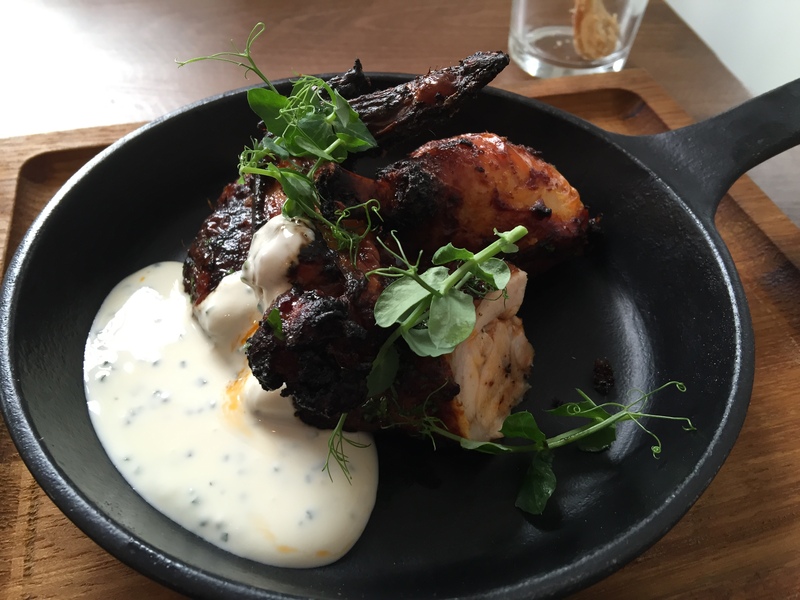 A small plate of barbecued chicken sees cuts from the breast, leg, and wing cooked accurately. The bird is of obvious quality, the skin crisp and with a back note of Dunkel lager that sits well without overpowering. Soured cream provides the little amount of acidity needed to level it all out. I always turn to the scotch egg here. The runny yoke glistening against the still warm layer of minced pig never fails to disappoint. 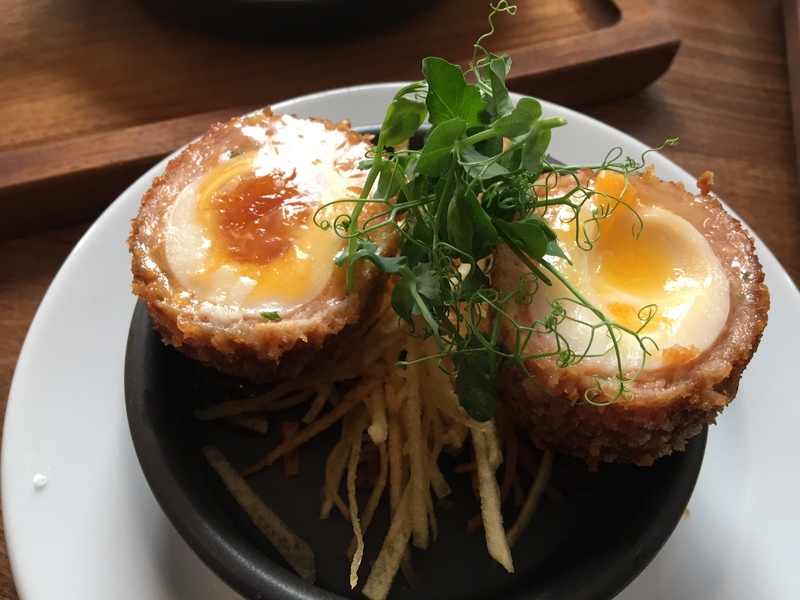 Here was the worst example I have had at Pure Bar, with the yolk all but missing from one half, which still makes it the best scotch egg in the city. What sets it apart from its competition is the beer ketchup, full of umami savour, which should be bottled and sold on every street corner. 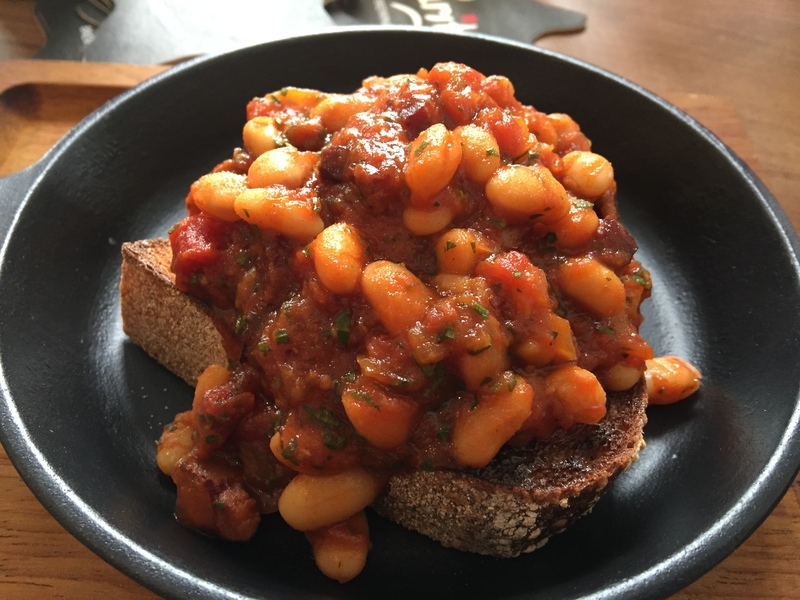 A thick slice of toasted sourdough with haricot beans steeped in a spiced tomato with pancetta was good, though all it succeeded in doing was make me remember how great the version at Lewis’s was. Scotch eggs, beans on toast and bbq chicken. The more deft of you more may have noticed that the small plates all reference classic pub grub, a theme that continues into the mains. 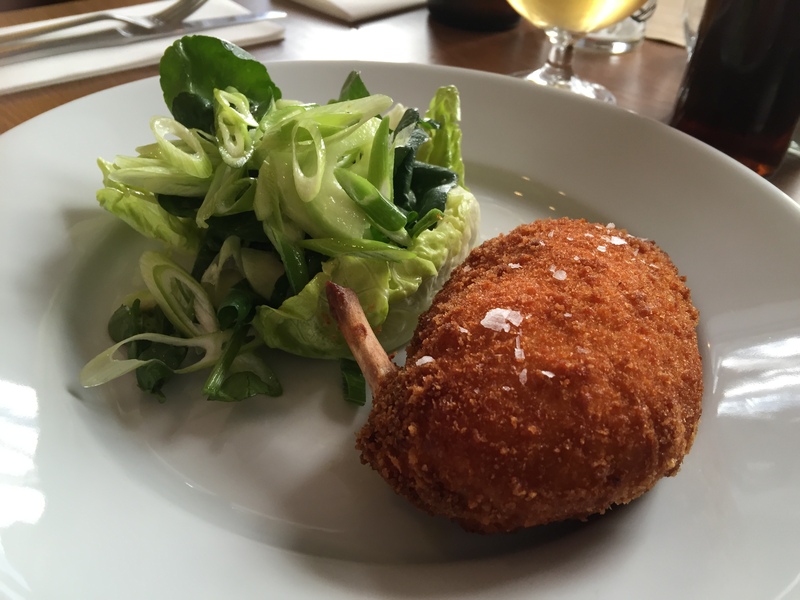 Chicken Kiev stayed true to its roots with a breast that oozed a garlic heavy sauce when carved. Its richness countered by a well dressed salad. 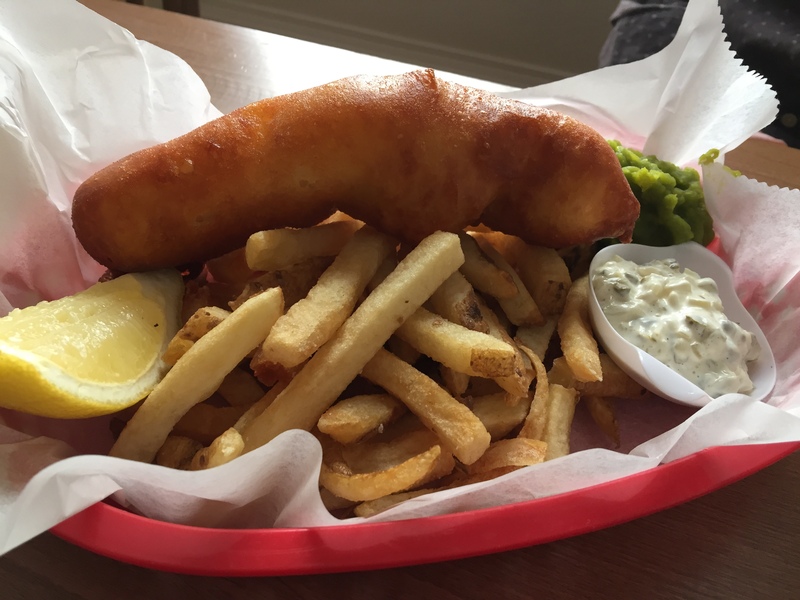 Best was the fish, chips and mushy peas. The firm Fish of the Day (Coley, I would guess) flaking apart at the suggestion of a prod, with good crisp batter. 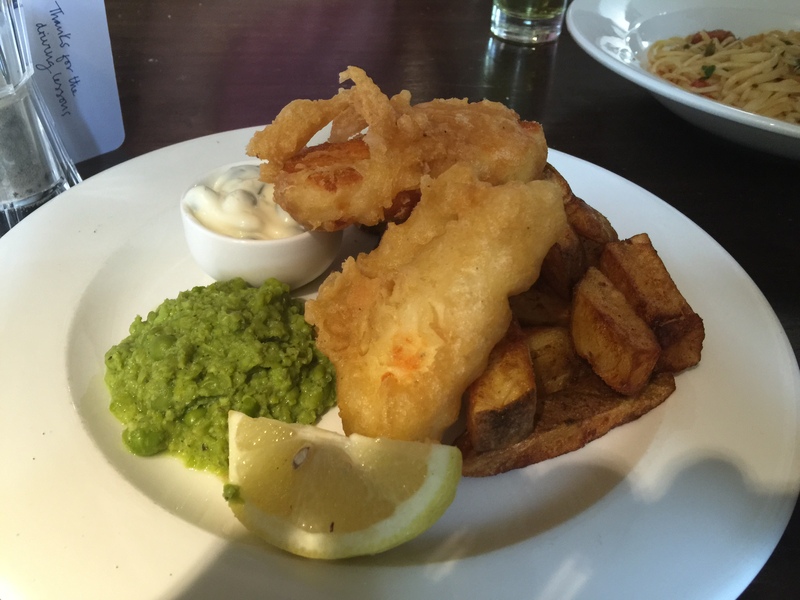 The peas had enough texture to create interest, whilst the tartar was piquant and sharp. We have no room for dessert, though I can tell you from previous boozy excursions that they never fail to deliver on a sweet hit of sugar. If ever there was a bar and kitchen that was ready to expand its Pure Bar; the food and drink set-up makes All Bar One look like a Weatherspoon. The food is well judged and deserves a wider audience. In a market littered with sub-standard chains, it is a refreshing change to see thought gone into every process. I wouldn’t be surprised if Pure Bar finds its way to other major cities, which, quite frankly, would be a good thing for everyone.